Zoulah is a "leeeetle" bit ticked off at me today so bear with me. Why is she mad? She is mad because she isn't doing a Halloween post. Zoulah understands that my sister-in-law Camille recently gifted me with some sunflower salad plates and she also understands that next week my sunflowers (actually sunbonnets) might be faded away, but she is still MAD! Witches are funny that way. Zoulah and I made a bargain that my next post will be a Halloween post. So please be nice to Zoulah: life is complicated enough without a witch throwing spells around the home. These are the Sunbonnets my husband planted in our backyard. When he first planted them --- all over I might add -- I couldn't tell what were weeds and what were wildflowers. I have loved the sunshine that they have brought all summer to my back yard. 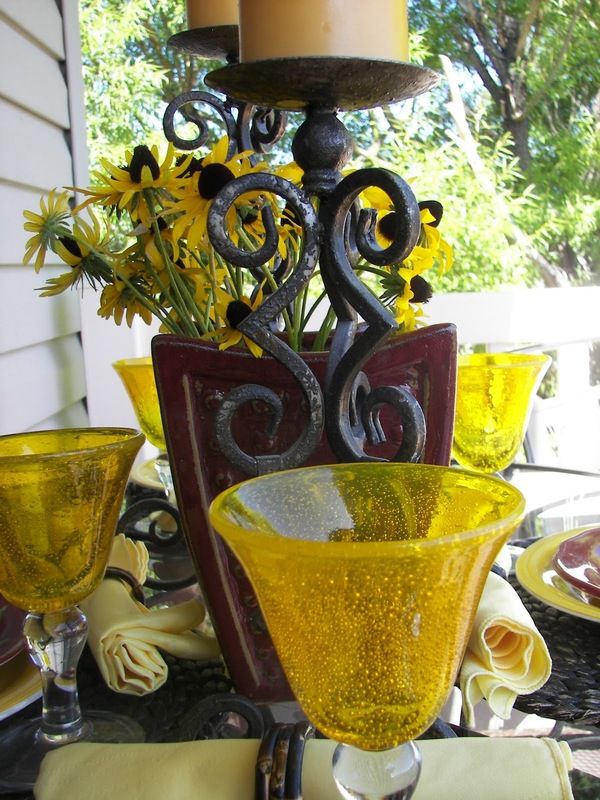 These yellow bubble glasses are a screaming yellow and add so much color to the table. 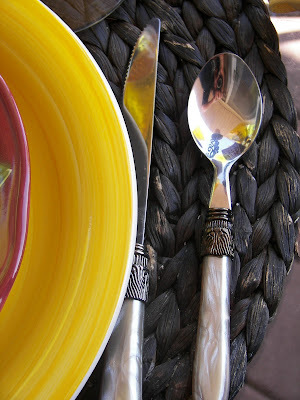 The flatware is from World Market -- very inexpensive and fun. Thanks for dropping by my Farewell to Sunflowers Table. Really nice tablescape. A perfect setting for late summer. I promise to be extra nice to Zoulah. You know, I have been hearing rumblings from the basement! I think Beulah is mad that she hasn't appeared yet either. I just have a few things to do before I can dare to dig her out - so pushy aren't they? I love the colors. They are so rich and luscious! Your pretty flatware is wonderful too. Come check out my giveaway! You won't want to miss it. What a great last hurrah for your sunflowers. We call these black eyed susans here. I used to pull these weeds in the flowerbeds until I found out they were my black eyed susans. Love their sunny little heads. Can't wait to see Zoulah work her magic. love your color combo, striking! I love the plates and think this is such a happy table! I'm glad you did it this week. 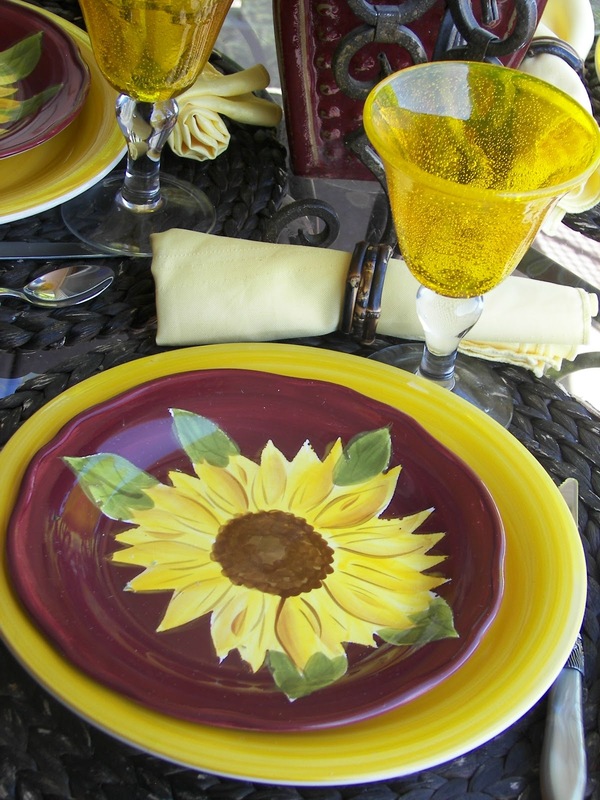 Joni, I love the sunflower plates, and Beulah can just wait! LOL! Such a festive tablescape, and the colors are perfect for fall. Such a pretty and happy table. I wonder if those flowers are the same as what we call Black Eyed Susans? They look very similar. Love your new plates too! 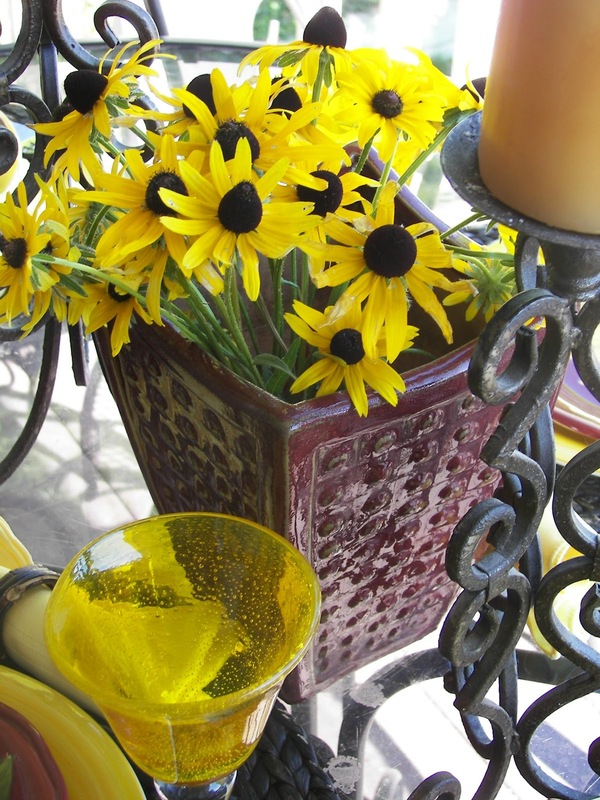 Joni,sunflowers are a favorite,love this! Those wildflowers grow all over the place,I heard 'em called "blacked suzie's",have you ever heard that? They are fantastic,bright cheer tablescape! Glad I came by for visit. I think Zoulah needs to take a chill pill...those plates were too pretty to hold back! 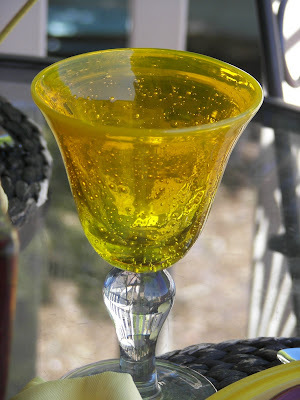 :-) They look so great paired with those bright yellow plates underneath and the fun yellow stemware!!! I love your sunflower table...the bubble glass is a nice bit of added color to an already beautiful table. I see Zoulah is alive and doing well at your home! I remember her well! What a good friend you must be to get these lovely dishes! The colors of the plates are so unusual and beautiful. The sunflowers stand out so well! Enjoy the sunbonnets, I know that the flowers will soon be gone from our gardens! What a pretty seasonal table! So pretty -- Glad Zoulah was willing to wait just a little longer so we could enjoy your pretty sunflowers. Love the tablescape, its really cute! 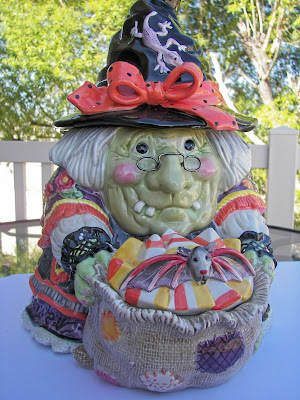 I always enjoy coming and visiting your blog, but this is my first time commenting! Consider me your newest follower! I love sunflowers! Your dishes are so bright and cheery, just like your sunbonnets:) Fall is officially here, so I am looking forward to all of Zoulah's antics! 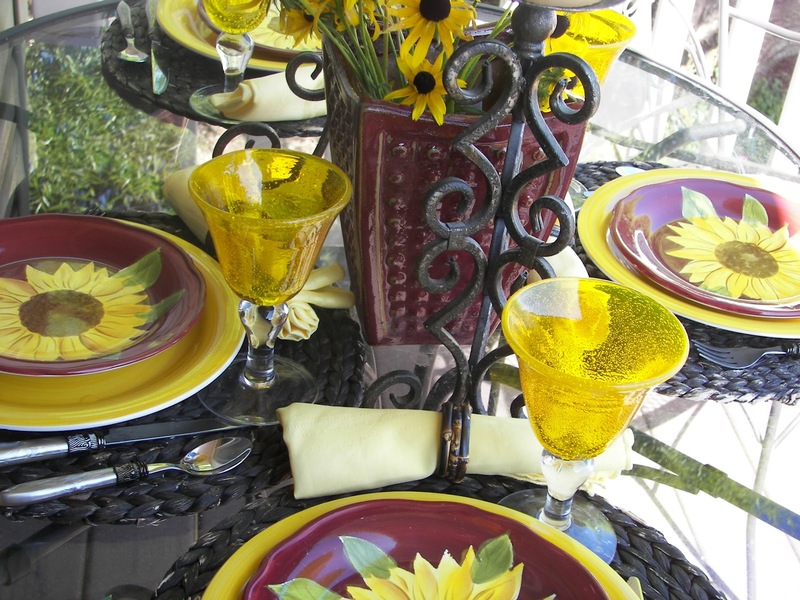 The plates are fantastic and your table looks great!